Which pump is right for your waterfall or stream? These charts serve as recommendations for selecting the right pump for your watercourse (average watercourse application). In these calculations approx. 5 metres of a 1½" hose are used (with a pressure loss of approx. 0.15 head height). Width of watercourse in cm x 1.5 litres / minute = Pump Flow Rate required in litres per minute. Eg 50cm wide waterfall will require flow rate of 50 X 1.5 = 75 litres per hour required at the correct height. 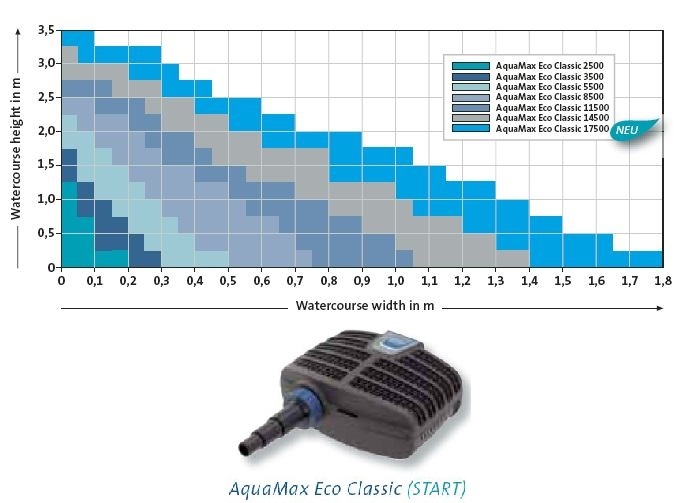 Example: using the above chart with can use Aquamax Eco Classic 8500 pump for a waterfall width of 800mm at 500mm head height. 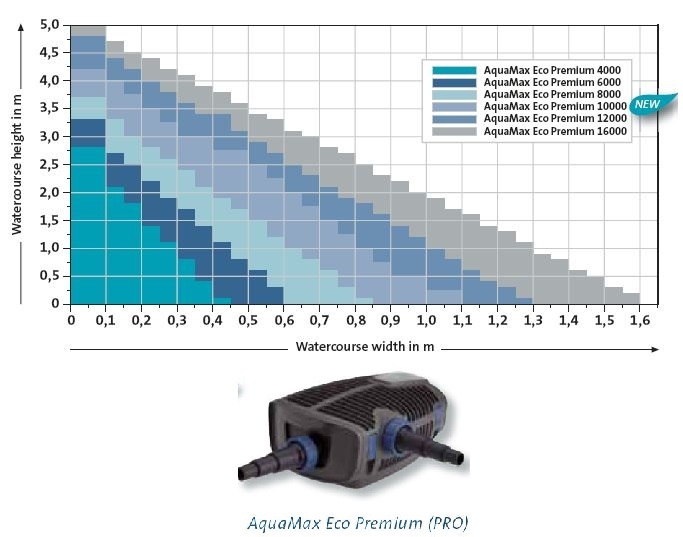 Example: using the above chart with can use Aquamax Eco Premium 12,000 pump for a waterfall width of 800mm at 1,500mm head height. 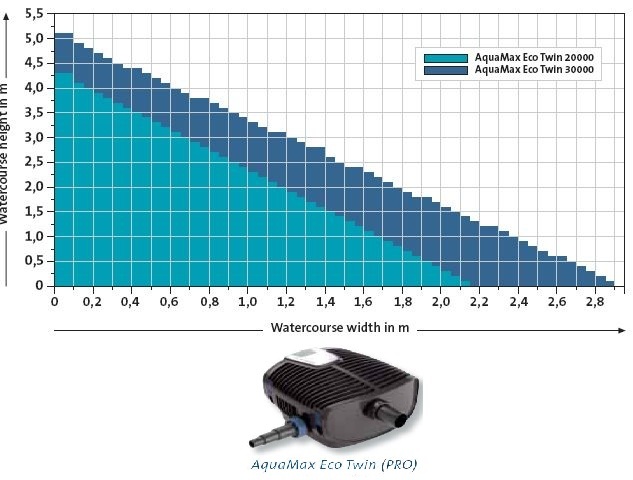 Example: using the above chart with can use an Aquamax Eco Twin 30,000 for a waterfall width of 800mm at 3,500mm head height or the same pump for a waterfall 2,200mm wide at 1,000mm head height. 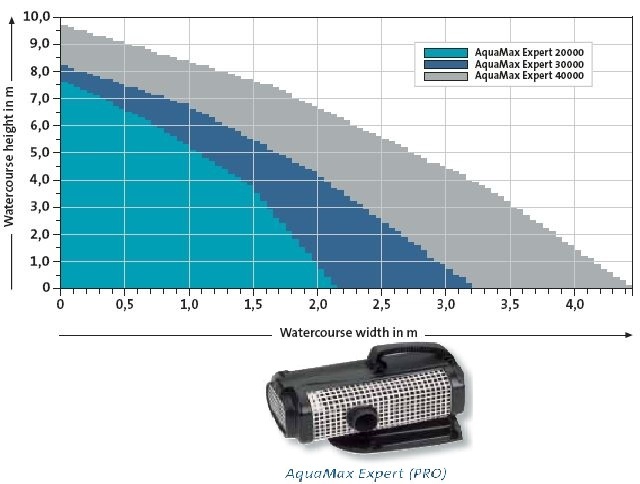 Example: using the above chart with can use Aquamax Expert 40,000 pump for a waterfall width of 2,500mm at 5,000mm head height.